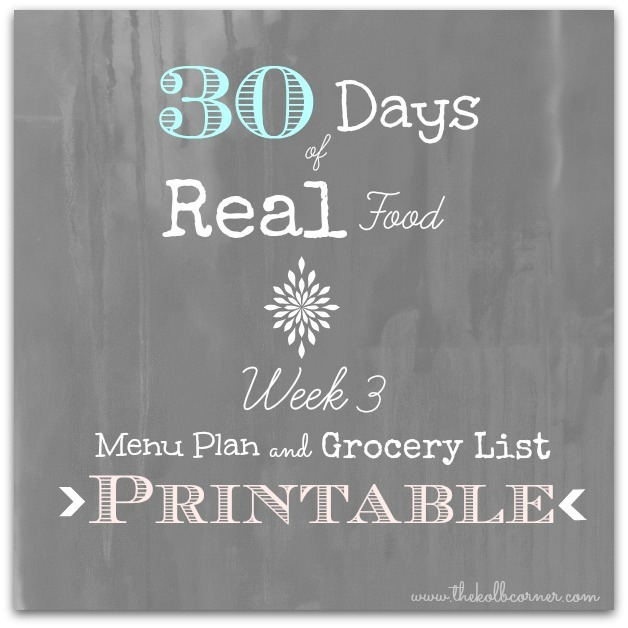 Here is week 3’s Printable Menu Plan and Grocery List for those of you following along on our 30 Day challenge! You can also download Week 1 and Week 2 if you missed them earlier. Keep in mind these menu plans were made for a 2 person household, so if you have more people you will need to adjust your quantities. Also we are trying to stick to food that only have limited ingredients–no more than 5– and you should be able to recognize all of them. On these printables I have marked the produce that should be bought organic with an asterisk. You don’t need to break the bank buying organic! Make sure you know the Clean Fifteen, Dirty Dozen method. I’ve also included links to recipes in the PDF. Some are mine and some are from other sources. You may also want to follow my 30 Days of Real Food board on Pinterest. Click on the link above to download your printable!